Welcome to the December Cross Canada Blog Hop, with our theme Where We Create. If you need ideas about how to organize your creative space and supplies, or if you just want to see our crafty spaces, this hop is for you. If you just hopped onto my blog, you can start here as this is a circular hop, but if you want to work your way across Canada, please start on the East coast with Michelle's blog. If you got here from Kirsten's blog, you are in the right spot! Now on to our hop! My craft room is long and narrow but gives me a lot of room for all of my goodies! As you come in the door, you see my Welcome sign on my wall. I made it with the chipboard banner Close to my Heart used to sell several years ago. I covered it with Claire B&T (retired) and cut the banner and Welcome using my Cricut and Cricut Craft Room. To the left is my desk and my Cricut Explore Air. My paper racks are also at this end of the room, and as you can see there are a lot of empty spaces! That can only mean one thing - I don't have enough paper!! I have a bookcase with most of my stamp sets, but I have a pile on my desk that still have to be added to my inventory spreadsheet. I am in the process of categorizing them to make it easier to find the one I want for a project. Right now, I have to go through them one by one to find what I am looking for and it is really time consuming. The red toolbox belongs to my husband and will be removed to the garage pretty darned quick! I have my inks in the CTMH tower but took it apart so the sections sit flat against the wall. This makes it so much easier to find the one I want and takes up a lot less room on my workspace. And I can't forget my Scrap n' Easel! I love this thing! Instead of my layout or card pieces lying flat on my desk, I can put them on the easel with magnets. It is also great for holding the instructions and cutting guides for workshops! One last thing, and the BIGGEST thorn in my side and biggest time consumer - paper scraps. I have mountains of them! There is so much in my room that needs to be organized but every time I start, I see the boxes and containers of paper scraps and can't think of anything else! I am planning on hauling them all upstairs and then organize by cardstock and B&T, then separate those into colours and patterns. I am also planning on cutting some of it into squares and rectangles that can be used to quickly put together a layout or card when needed. I just need to find a container to keep them in. I think I have one, but need to see if it will work. Oh, ignore the bag of bows in the black and white striped box. That box is nearly full to the top with paper scraps. The bows just ended up in there for some reason and I didn't notice until I put the picture here. That is my creative space. It is a work in progress, but it is coming along. I have lots of cupboards (oh, that is going to be fun to tackle...) and drawers for storage, and I know they will be FULL once I get it all organized! Thanks for hopping along with us this month, and I hope you have gained some inspiration for organizing your own space. Again, please leave any comments as we all love to hear from you! Next up is Candra's blog and more great craft space ideas. Now mark your calendars for January 15, 2016 when we will be showing you our love of watercolours! Until then, Merry Christmas and a safe and happy new year! Welcome to the November Cross Canada Blog Hop and our theme, Getting Ready for Christmas! We hope you will take the time to leave comments on our posts, as we love to get feedback from our viewers, whether it was something that you really liked or some new technique that was used that you would like to learn more about. By leaving us comments, we get to hear what you like, and what you want to see. Thank you. Now on to our hop! The first is a Windmill card. I LOVE these! They are a bit fiddly to put together, but so well worth the effort! I used Close to my Heart White Pines paper, Cranberry cardstock, silver Shimmer Trim, and a Silver Sequin and Bitty Sparkle in the center. This next one is a Sunburst card made with the Close to my Heart Pear & Partridge (no longer available) and White Pines papers. Easy peasy! I made several more and no two are alike! The next one I made for a friend at work who loves cats. I am so happy with how this turned out and I hope she loves it as much as I do! The cat is a pennant that I just turned upside down! 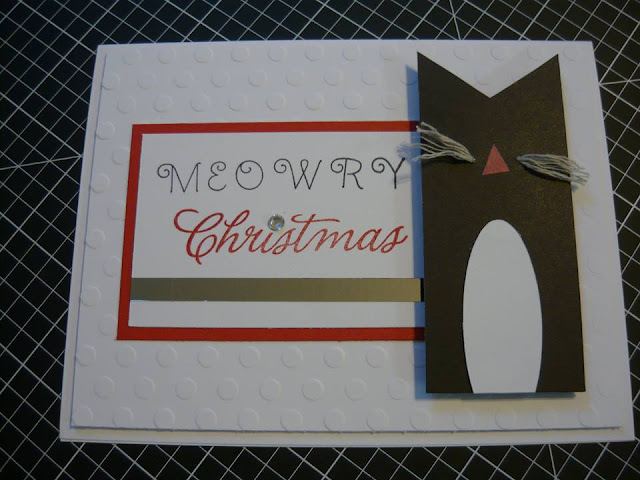 The whiskers are a piece of Whisper twine that I divided in half and then threaded through the paper, trimmed and frayed. The nose is a piece of pink Washi tape! I also used some of our new Silver Foil Tape for some added bling! I have a ton more that I made and will share in another post. Again, if you are interested in making any of these cards, just leave me a comment and I will share the details. Thanks! That's it for this month! Next on the hop is Kirstin's blog with some more great Christmas ideas and artwork. Next month, please join us again when we show you Where We Create! Some of us have amazing craft rooms and some, like me, have a work in progress. So hop on by and get some ideas for your own creative space or leave some ideas that you would like to share. I LOVE going to crops!! It is about the only time I get to spend all day doing what I love without worrying about grocery shopping, mowing the lawn or getting laundry done. Julie's presentation explained how to HOLD a crop, which is something I would like to do. When you are expanding your customer base, you first need to go find the customers. Once you get your name out, THEY will find YOU! To make that easier, brand your crops. Give them a name that is easy to remember and find: "Scrapping for Soldiers", "Crop for Heart", etc. I love Julie's idea of a themed crop, and CTMH has some awesome stamp sets that would be perfect for making the invitations. Have you seen them yet?? Luau, Fiesta and Chocolate are three of my favourites, but if you prefer to have just a general party, there is a set for that too! I want to give you the item numbers for them, but after searching the Close to my Heart website for 30 minutes, I can't find them (and I KNOW I was looking at them yesterday...). Anyway, to continue with the theme idea, create a plan and work with it. Have draws and games, and make sure everything is personalized so your name goes home with the croppers! Promote your crop EVERYWHERE! (Okay. Everywhere that will allow it. I know some places will only post if you are holding the crop for a charity.) The laundromat, the grocery store, and even the local coffee shop. Create a Facebook group for your crop, not just an event page. Event pages are gone once the crop is finished, but a Facebook group is there until an admin removes it, so people can always go back to see posted artwork and get ideas from other attendees. When someone signs up for your crop, ask them to pass the information on to others. Ask them to add a crop poster to their bulletin board at work, or in the common room of their condo or apartment. Also, invite sidelines, upline, downline and friends! Provide attendees with a treat or goodie bag containing CTMH items (old stamp sets are great for this! ), baby wipes (Dollar Store), chapstick, and what ever else you feel like adding. Also add a small project such as a few cards they can make during the crop or later at home. Teach classes that use Close to my Heart product. Take pre-orders for crop projects and collect the money at the time of the order. This not only ensures you are paid, but it also gives people more incentive to attend. Have a make-and-take for all of the attendees to work on and pre-cut everything in advance. This gets people up and doing something different. Make some extras for anyone who would like to buy an extra to take home and make later. Crops also help you add to your team when you tell attendees how they can get the product at a reduced cost! Also, during the crop, make sure to visit!! Go from table to table empathizing, complimenting, and making our attendees feel special! Get to know your croppers. They are customers and potential downline! Finally, add your crop to your blog! At least weekly, make sure to add to the blog to keep it in front of your audience. I know in Blogger, there are all sorts of gadgets you can add to the side bars. Give it a try! It just might lead to your next customer or downline! So that is it for Julie's excellent presentation on crops! I hope to hold a crop of my own at some point and will make sure to keep her ideas in mind! Thanks, Julie!! Sundi Hendricks was a hoot! With her fishing hat, rod and reel, and spunky attitude, she had all of us hooked! Sundi defined fishing as making connections, creating friendships, developing relationships, and creating memories. Sometimes our customers become our friends and to my way of thinking, that is definitely a good thing! 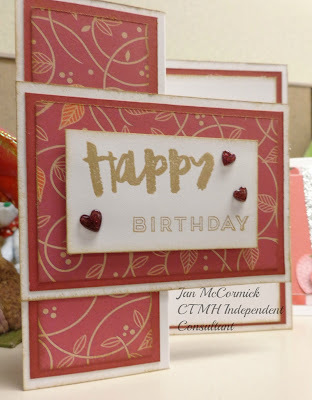 She also pointed out that when we go out, we should always have something CTMH with us, whether it is cards we make, some Base and Bling jewelry, an Idea Book, or just business cards. Anything CTMH that will start a conversation! Talk to people EVERYWHERE! In line at the grocery store? Talk to the person behind or in front of you. Or both! Have an event planned? Tell them about it! Invite them and ask them to invite one or two others! Sometimes you have to invite people over and over before they will commit, and that's okay! Make sure you have handmade cards handy and hand them out to people who decline an invitation to a party. Make sure to include your business card too. When they say they are not interested, say "That's okay. Please take this card and share it." When you are chatting with someone, keep your eye on the time. Instead of keeping them for a long time, get their email address so you can send them information about Close to my Heart and your team that they can then look at when they get home. Then call them in a few days to ask what they think. That is it for Sundi's presentation. I loved her analogy of fishing and would enjoy future presentations from her!! Well done, Sundi!! Convention 2015 - Fun, Friendship and TONS of Learning! Convention 2015 is over and most of us are home, or at least on the way home. It was a wonderful time, with business classes, creative sessions, extravaganza and the product premier. So much to learn! We have six gorgeous new paper packs and seven new ink colours which replace existing colours in the Enchantment collection. These new colours are so vibrant, they are excellent replacements! We had some great business classes presented by some amazing consultants! Brae Montgomery gave us some great tips on Long Distance Leadership. Brae told us to make use of Facebook, Twitter and other social media to communicate with our teams that are not close by. Make sure the name you use on social media is included on your business cards too! Hold monthly challenges or games with your team. Create a Get Connected My Crush album and challenge your team members to add photos and a note about themselves to the album. Also create a team PML album. Each month, send three PML cards (CTMH or handmade) to team members to add something that happened that month, and then return to be added to the album. Have a team meeting at least once a month. These can be in person, by phone or even online! Your meeting can also be recorded using applications such as Spreecast.com, which is similar to YouTube, but unlike YouTube which deletes the video after a certain time, Spreecast keeps it so your team members can go back and look at it months later. Brae also pointed out that a yearly survey is an excellent tool for getting feedback from your team. SurveyMonkey.com is simple to use and lets you tailor the survey to your needs. Brae pointed out a book that helped her and recommends to everyone to read - Lean In by Cheryl Sandberg. Something else to add to my reading wish list! That's it for this blog. Stay tuned for more blogs as I get them completed. With two dogs bugging me for attention (they were "on vacation" themselves at the kennel for the week we were in California) and a husband wanting my help with laundry, it is hard to get anything fun done! :-) But stay tuned and I hope to get at least one more done today. Also, I found a whole page of info from Brae that I missed! Secret Sister Month - Pick a month to select secret sisters. I had never heard of this so had to go do some Googling. Besides being a Country music duo, secret sisters provide support to other consultants in the way of birthday cards, small gifts, or just an ear when we need someone to listen. Use your team members when you need help. Connect with your team members on a regular basis. If your team members are quite a distance from you and need some help or inspiration, see if a there is a team leader closer to them that can connect with. Create small inspirational videos about what you are doing or are going to do, including clips from convention, Connecting events, etc. These can be used not only for team members, but also as aids when showing opportunities to potential downline. Now I have everything (or at least most) from Brae and will have another blog soon! Welcome to the June Use Your Stash blog hop! This month our theme is water colours, whether it is pencils or markers! As you make your way through this hop, please leave your comments as we all love to hear from you. All product used in this project is from Close to my Heart. If you got here from Shirley's blog, you are on the right track, but if you get lost along the way, just head to Paige's blog where you will find the complete list of hoppers. I love my watercolour pencils and the blending pen. I love my markers as well but find the pencils give so much more control over the blending. I made two cards this month - one using my ShinHan Touch Twin alcohol markers, and the same card using my watercolour pencils. The alcohol markers result in brighter colours, but I like the soft, muted look of the watercolour pencils too. For the first card, I embossed the flowers from the Wavy Blooms stamp set (D1651) with silver embossing powder on White Daisy cardstock and then coloured them using the Marigold (YR24) and Golden Yellow (Y222) pens for the yellow flowers and the Tender Pink (RP198) and Cherry Pink (R5) for the pink flower. The leaves are coloured with the Sap Green (GY235) and Leaf Green (GY234) pens. The card base in both cases is New England Ivy cardstock. Now here is the same idea stamped with Hollyhock and Honey Exclusive Inks and then coloured with Holiday Red, Sunflower, Honey, Citrus Leaf, and Clover Meadow watercolour pencils. I used my blending pen to blend the colours and then used 3D Foam Tape to pop two of the flowers up and give some added dimension. Which look do you prefer?? Personally, I can't decide. I love them both! The two sentiments are from the Operation Smile stamp set, Happy Everything (D1653). They are both stamped in Cocoa Exclusive Ink. I cut the paper longer so I could make them into banners, which i think adds just a little interest. The Silver Shimmer Trim (Z1799) adds just a bit of glitz too. That's it for this month. If you have seen anything you would like to know more about, please let me know in the comments and I will get back to you! Thanks for taking in our hop this month! Next on the hop list is Nicole with some more beautiful artwork!. Welcome to our June bloghop featuring Mini Albums! If you see anything you would like to purchase, please contact your local Close to my Heart consultant! We hope you will leave comments on our posts as we love to get your feedback, whether it is something you like or a technique you would like to learn more about. Now on to our hop! I you have just come from Donna's blog, you are in the right place! But since this is a circular hop, you can start anywhere! If you get lost along the way, just return to Michelle's blog where you will find the complete list of hoppers. I really love our Picture my Life cards and although I have used them previously IN a mini album, I have never used to actually MAKE an album! I saw this on Pinterest (I can't remember who posted it and now can't find it. If I do, I will post the person's name.) and really liked it. It is a quick easy way to make a little album! For this album, I used the Seaside PML cards, Assortment and Complements. Each page is a 4X6 PML card and the pockets and tags inside are the smaller 3X4 PML cards. I attached the "pages" to each other with our Gold Dot washi tape leaving about a 1/8" gap between pages to allow for some embellishment. NOTE: If you want to round the washi tape corners on the pages, do it as you go. I thought I would do it when the album was finished and it was not an easy task! Here, I layered several of the Seaside Assortment to cover the ship's wheel that is actually on this card. I used another sticker from the Seaside Assortment to cover the ice cream cones on this card and popped it up with some thin foam tape for a little added dimension. On the last page, I added a piece of Lagoon cardstock that I had distressed, then layed a few of the stickers from the Assortment as well as the starfish from the Complements. The next few pictures just show the smaller cards that were used as tags. I want to add some sort of embellishment to them but not sure what to add since there is really not a lot of room. That's it for me for this month. I am the last stop on this hop, so from here you can return to Michelle's blog! And remember, if there is anything here you would like to add to your own stash, please contact your local Close to my Heart consultant! When you place an order of $50 or more, you can purchase the Stamp of the Month for only $5! Also, during the month of June, when you purchase any My Crush™ book and its accompanying assortment pictured in Annual Inspirations 2014–2015, you will receive the coordinating stamp set FREE! That is a savings of at least $9.95 USD / $10.95 CAD! Choose from five lovely My Crush book offerings that will provide a swoon-worthy background for your favorite memories. From family reunions to camping adventures to holiday countdowns—and much more—you will be crushing on all these books and the possibilities they provide. Every My Crush book features a hard cover with wire binding and cardstock-weight pages that are printed with eye-catching designs to form the perfect bases for your memory keeping. Additionally, each My Crush book also features unique details—from glossy print, to vellum pages, to gold foil, to ink-resistant patterns—that make displaying your personality easier than ever. Plus, once you add the artistry of the coordinating assortments featuring sticker sheets, envelopes, alphabets, cards, and journaling spots, along with your free stamp set, you will be well on your way to your own gorgeous mini book creation! This offer is only available while supplies last and once they’re gone, these books are gone for good, so put your orders in early to get your summer romance rolling today! This month's challenge is based on the Brushed paper pack, brought to you by the new Annual Inspirations, hand picked by Nancy Klein. If you came from Terry Ann's blog then you're in the right place, but since this is a circular blog hop, you can start anywhere! Just in case, the full list will be at the bottom. So, as always, grab your coffee, tea, or water, relax, and hop around the team with us. I love the Wanderful paper pack! It is perfect for our trip to Mexico this past Christmas. My layout is the Additional Artwork from the Wanderful WOTG, I wasn't sure at first, but the colours are perfect! I made a few of my own changes to the layout (added banners and didn't stamp the airplanes on the Gypsy strips) and am really happy with it. Instead of setting the banners side by side and slightly overlapping, I decided to layer them all! I love the way it looks. The main WOTG layout uses a LOT of Cricut cuts, one of them being the circles overlay which is cut twice using two different papers and two sizes. The overlay cut from B&T is smaller and the centers of the circles are used in the larger overlay. I had the two circle overlays cut with the B&T left and was just going to put them in my ever-growing scrap bin, but decided instead to cut one in half and use it on a card! I stamped the flowers and butterflies from Your Own Kind of Wonderful (D1627) and A Flowering Bunch (S1306) on Colonial White cardstock using Gypsy, Honey, and Pear Exclusive Inks and punched them out with my 1" circle punch (Martha Stewart, not CTMH...). The sentiment is from my favourite stamp set, For Every Occasion (D1187) and is stamped in Black and the banner is distressed with Honey. I was going to leave the flowers plain but they really needed some bling. Thank you, CTMH, for our bulk Sparkle Gems! This is something else I use a lot of! That's it for me! Thanks for joining us this month and come back next month to see what creative projects we can bring to you! Thank you for stopping by and please feel free to leave a comment. Your next stop is Kerry's blog. Happy hopping!! 8. Janet McCormick - You are here! Sunshine, sunshine and more sunshine!! Love it! Unfortunately, I get to see it for the most part through a window because I am at work. Oh well. Only 68 more days until the hubby and I head to Disneyland for the 2015 Close to my Heart Convention! Woohoo!! I LOVE Disneyland!! Disney World is great too, but the original is my fave! There is so much to do in Disneyland, but you can see both parks and ride a lot of the rides in one day. Disney World - not so much. It is a one-park-per-day kind of place and there are five parks! Disneyland you can do in a weekend, whereas Disney World needs at least a week! I have blogged previously about what to take with you when you visit the parks, but I have never really mentioned the rides. There are so many to choose from so I picked ten and listed them here. Don't get me wrong - there are so many that I love to go on, but there is just no room for all of them. Adventures of Winnie the Pooh - A kiddy ride but still a lot of fun for adults. A great way to get off your feet for a few minutes! Take a ride through the Thousand Aker Woods and visit Winnie the Pooh and his friends! Disneyland Railroad - A relaxing ride around Disneyland Park and you can stay on as long as you want. Some of the trains also have a place for scooters so if you have a mobility aid, you can ride without leaving it behind and then trying to remember which station you left it at! Pinocchio - Another kiddy ride that is great for adults. Take a ride with Pinocchio, Gepeto, and the rest of the gang. Peter Pan - What's better than soaring over the rooftops of London with Peter Pan, Tinker Bell, Wendy, and the boys! Captain Hook, the Lost Boys, the Indians - they are all there! The Matterhorn Bobsleds - This fast roller-coaster style ride is a lot of fun! The Abominable Snowman is there to try and stop you as you travel through his land! Grizzly River - Yes, this is actually in California Adventure, but it is a great ride for cooling off on a hot day! Ride on a huge rubber raft that takes eight people through rapids and over waterfalls! Yes, you WILL get very wet!! 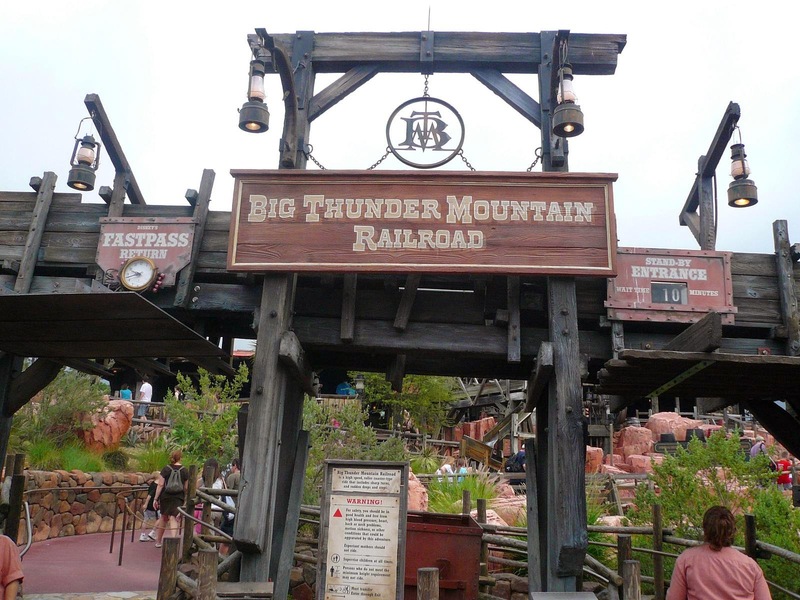 Big Thunder Mountain Railroad - An old gold mining town is the set of this fun, fast roller-coaster style ride. Tunnels, hills, and everything else you can expect from a coaster! Radiator Springs Racers - A newer ride (only about a year or so) that takes you through Radiator Springs with Mater, Lightning McQueen, and all their friends. Get shined and tuned up, then out to the track to race another car to the finish line! Who will win this time?? 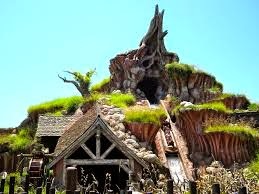 Splash Mountain - Brer Rabbit, Brer Bear, and Brer Fox all sing you songs of the South as your log boat meanders through the Briar Patch. A few waterfalls and some rapids add to the fun, and at the end... well, why should I spoil it? Just remember that you could get wet on this ride, depending on where you sit in the boat. And smile! Your picture will be waiting for you at the end of the ride! California Screamin' - My favourite ride!! This fast and furious coaster is THE BEST!! THREE! TWO! ONE! And you are catapulted up the first hill! From there, the track twists and turns, rises and falls, and then there is the loop-the-loop around Mickey's head! WOW!!! What a RUSH!! Can we go again?? Remember to smile! Your picture will be waiting for you! The Haunted Mansion - What is a trip to Disneyland without visiting the Haunted Mansion!! Enter, if you dare, and find yourself in a room where, once the door closes, the walls suddenly seem to get taller! When the door opens again, get ready for a trip through this spooky realm! You might even find a ghostly visitor joining you on the ride! Pirates of the Caribbean - Another must-do! Ride through the pirate lair with Jack Sparrow and his motley crew! 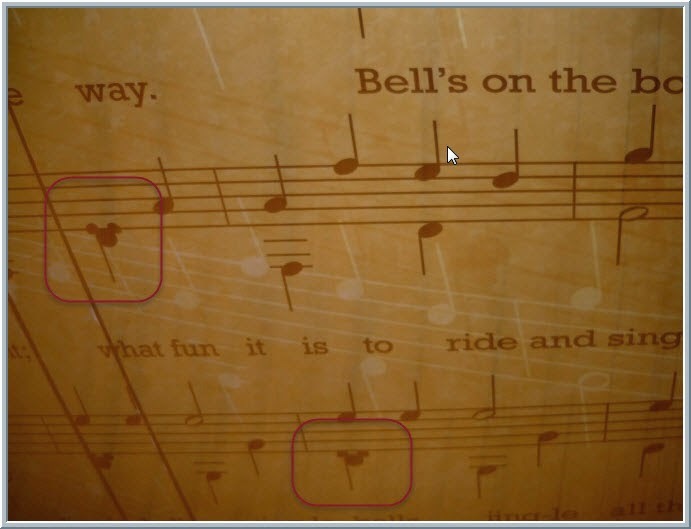 Keep an eye on the Jack Sparrows in the ride. There are a few and once in a while, Johnny Depp himself has been known to make an appearance in costume! There are so many more that I always have to ride - Prince Charming Carousel, Dumbo, one of the streetcars on Main Street, Small World (although I end up with the song stuck in my head for hours after! ), and Storybook Land to name a few - but this list gives a few to choose from. Just remember that some of them get you REALLY wet, but they are all great ways to get off you feet for a while and cool off. Whether you are visiting Disneyland or Disney World, the main thing is to have fun! It doesn't matter if you are 5 or 95, this really is the Happiest Place on Earth! Enjoy!